26 5-ft battle maps (w/ Dynamic Lighting for Pro subscribers). 8 10-ft player maps with 5-ft subdivisions (w/ Dynamic Lighting for Pro subscribers). 10 non-scaled, non-gridded maps of towns or regions. An interactive Sin and Virtue Points tracker. Journal organized into six chapters (the original six Adventure Paths), with each chapter divided up into multiple parts. 7 appendices for expanded information on regional lore and information as well as random travel encounters. 11 pre-generated level 1 character sheets with matching tokens. Over 100 generic monster sheets with matching tokens (94 w/ pics). 82 Named NPCs with character sheets and tokens (66 w/ pics). 90 Background NPCs (info and lore but no sheets, 14 w/ pics). Over 200 magic items (54 with pics). Additional relevant supplemental rules, including diseases, environmental effects, regional travel, and more. Compendium expansion which features new content released during Rise of the Runelords and can be added to any Pathfinder Roll20 campaign. Random Encounter Addon which includes all the creatures that only appear during random encounters. The Journal is divided up into six chapters representing the original six adventures that made up the total campaign, as well as a preceding Player’s Guide to introduce the adventure and provide relevant background information when making characters. The more linear structure of Paizo’s Adventure Paths makes organizing the adventure within Roll20 way more convenient and intuitive compared to the typically more open-ended D&D campaigns. Each chapter has to be completed sequentially (and designed for specific levels, in order), and each features a proper beginning, middle, and end, as well as their own villains, themes, and locations. In Roll20’s Journal, each chapter has multiple subheadings for each part, which usually consist of a single map or dungeon and some notes. Handouts for the chapter are provided at the end under their own subheading. As is the case for all of Roll20’s modules, all the relevant NPCs, magic items, lore, and handouts are hyperlinked within the text, making it easy for DMs to find what they need at any given moment. This is doubly useful for such a large campaign that features hundreds of magic items and NPCs. Since Rise of the Runelords has been around for so long I won’t comment too much on the story itself, though it’s my first time reading through it. I enjoyed the story quite a bit, though it’s certainly not without its tiresome clichés and awkward moments. The sheer scope and breadth of content is impressive. 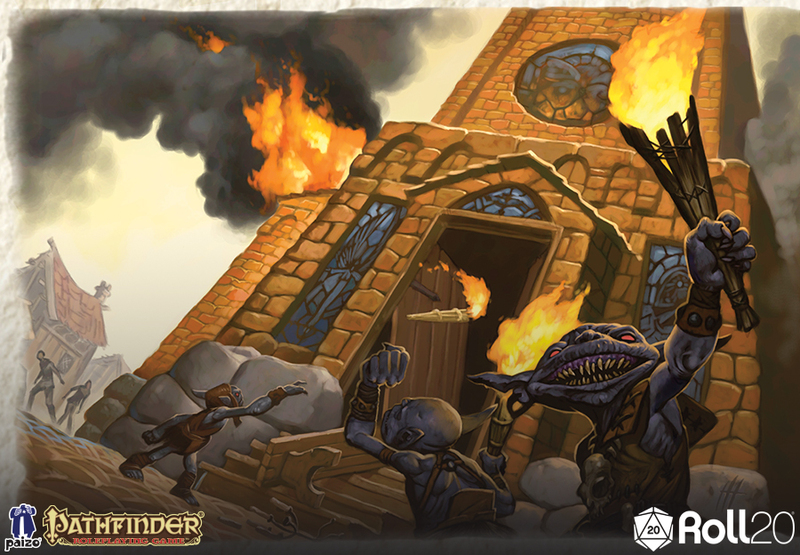 Delve into a hidden shrine beneath a goblin lair. Explore a haunted mansion. Investigate Jack the Ripper style murders. Repel a giant and dragon siege on a town. Battle ogres on a dam. Survive an arcane laboratory designed around the seven deadly sins, and ultimately thwart the return of a tyrannical god-king. 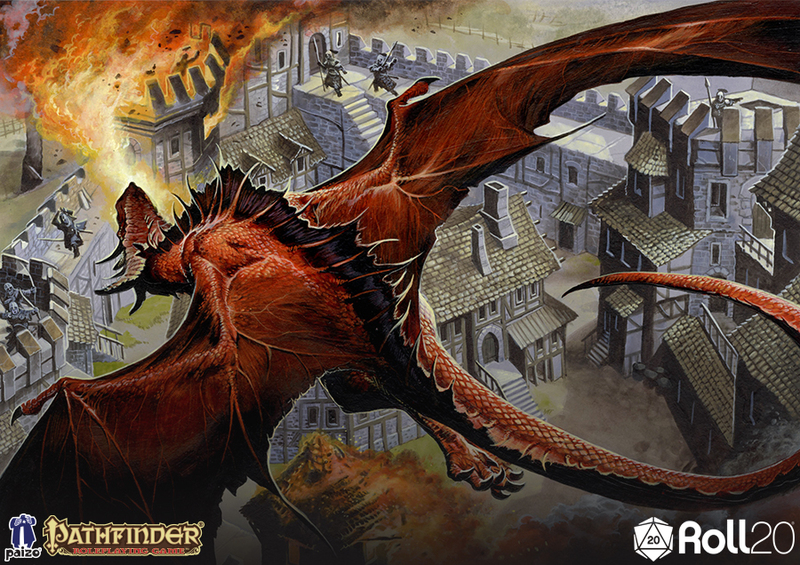 It’s an epic fantasy adventure that does a solid job at showcasing what Pathfinder has to offer. Roll20 modules live and die by their maps, and I’m pleased to report that Rise of the Runelords‘ maps are fantastic, well-detailed, and colorful. Roll20 has placed all the DM/GM information and map annotations on the GM layer, including a nice new color legend that points out whether stairs are ascending or descending. All maps have built-in Dynamic Lighting (a highly recommended feature for Pro subscribers) and tokens in place, and the majority of maps are properly scaled for 5-ft grids. A special Sin and Virtue tracker is presented as a DM-only page. Multi-sided tokens are used as counters to track PCs’ various sins and virtues over the campaign, which come into play during a unique dungeon later on. The only odd design choice was separating the random encounter monsters from the rest of the campaign, into an addon which is included in the purchase. This addon can easily be applied to the campaign to add those monsters back in (their tokens are still present on the token page). Alternatively, as the module suggests you could add them to a GM-only campaign and then transmogrify individual monsters into your real campaign. That seems like a big hassle just to cut down on a few character sheets. I’d rather include every monster I’d need, then I can delete any I don’t want to use. Other than that annoying quibble, I was very impressed with the entire Rise of the Runelords Anniversary Package. I was initially surprised that Roll20 would choose to adapt a very old Pathfinder adventure, but after looking through it I can see why. It’s still a very solid, classic high fantasy adventure, filled with striking artwork and high quality map design. Over 30 dungeons and battle maps, most of which are 5-ft scale. Structured campaign, organized into each separate adventure path chapter with multiple subheadings. Sin and Virtue tracker makes it easy to track PC scores for when they enter the Runeforge dungeon. Excellent world-building and detailed notes on lore of the region, individual towns and cities, and all major and minor characters. Separating random encounters into a separate addon creates an unnecessary work around. Most magic items lack artwork. 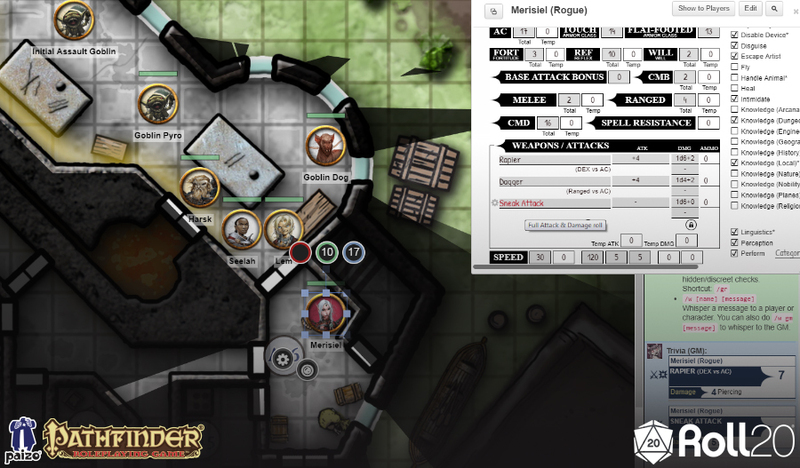 The Verdict: As the original Pathfinder ADventure campaign, “Rise of the RUnelords” is well suited to Roll20, with a huge variety of creatures and maps, and a well-organized structure.